A slighly softer and less harsh version of the Full Flavored Red. Featuring a slightly more natural flavor profile and a more traditional aftertaste, this is a tobacco that is an easier every day smoke. Each bag is created using a unique processing method to bring out the all natural flavors of the tobaccos and deliver an uncompromised smoke. It is a matter of taste, that is why I will be sure to mention what store brand Cigs I used to smoke. I use this Tobacco with the Full Flavor Tube Cut 100's, and Actually prefer to Marlboro Red 100's. This was only the second tobacco i tried, first was red variety but too rich for me. And I used to smoke Full flavor cigs. 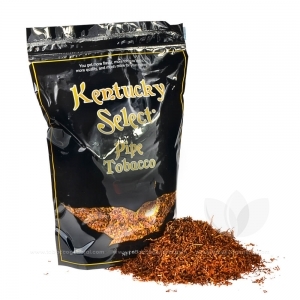 This tobacco seems less than many full flavor, but stronger than lights, more in between. when used with full flavor tubes. Until Prices Spiked from Taxes several years ago in FL. I smoked only Marlboro Red Kings. After price started rising I switched to 100's, and got used to them. I will buy L&M reds 100's if I for some reason forget or run out of tobacco, when on the go. They are cheaper, and not that different from mine, although lower quality. But i always prefer Mine, unless I am out. This is by far 1000 times better than any cigarettes you can buy. I ran out and smoked a half pack of Virginia slims, by the next morning I was sick to my stomach. I feel this is so much better. Kentucky select is top shelf and better prices than others. Makes a great light MYO/RYO cigarette. The bag I buy from tobacco general is better quality than what I used to buy in town. Makes a great light MYO/RYO cigarette. The tobacco I buy from here is better quality than what I used to buy in my town.